Another early wake up this morning, although I slept better last night. After breakfast, we headed for St. Augustine, FL, the oldest city in the nation. http://www.oldcity.com/history-information.cfm It was first sighted in 1513, by Spanish explorer, Don Juan Ponce de Leon, and was founded in 1565. It was a beautiful day. When we arrived in St. Augustine, we went on a short tour (it isn’t very big). We went inside Memorial Presbyterian: http://www.memorialpcusa.org/. We also took a tour of the Oldest House. the González-Alvarez House is the oldest surviving Spanish Colonial dwelling in Florida. The site has been occupied since the 1600s and the present house dates to the early 1700s. Since 1893 visitors have toured the house to see evidence of the Spanish, British and American occupations of St. Augustine and to learn how the residents lived. In 1970 the U.S. Department of the Interior designated the house a National Historic Landmark: http://www.staugustinehistoricalsociety.org/. The house was…old! 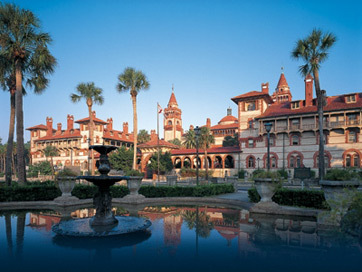 We drove through town, and by Flagler College, which was originally built as a luxury hotel in 1888. We stopped for lunch at Harry’s Bar and Grill, and ate outside in the perfect weather: upper 70’s, sunny, and a nice breeze. We noticed a statue of a bulldog on the patio! They sure love bulldogs in the South! Also, here are some beach pictures I took while on Jekyll Island yesterday. Beautiful, huh? I thought so. It was built in 1891 as a summer home for William McKay (http://people.seas.harvard.edu/~jones/mckay/mckay.html), and purchased by the Rockefellers in 1905. 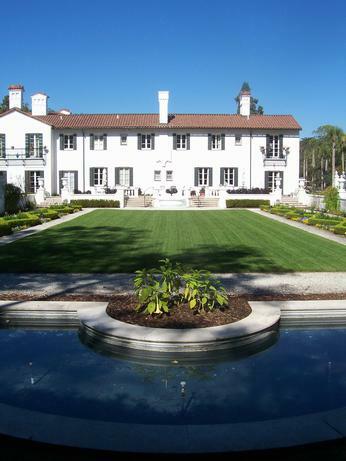 It was originally over 9000 square feet, and the Rockefellers added over 3000 square feet. It is now over 13,000 square feet! Yes, massive. After my run, I went down to the pool to lie out and go swimming. I also went down to the beach, which was directly behind our hotel. Breathtaking. For some reason, being on the beach stirred up a lot of emotion for me. I then went back to the room to get ready for dinner…our last dinner of our trip. We went to Driftwood Bistro. I don’t recommend it. Tomorrow we go to St. Augustine, FL, before getting on a plane at 6PM and heading back home. Today I got up EARLY. Well, early for vacation. I had to run before we left for Jekyll Island since there wouldn’t be any time later. It was gray and muggy, and I was half asleep for my run. It was a short one…just three miles. I was soaked when I got back to the hotel, both from sweat and rain. It started to rain about halfway through my run. After breakfast, we headed south for Jekyll Island, GA. It was stormy! I don’t know if y’all (look, the south is affecting me) heard about the tornado in Mississippi, but apparently the storm we felt today was the tip of the storm they had in Mississippi. It was nasty all day. 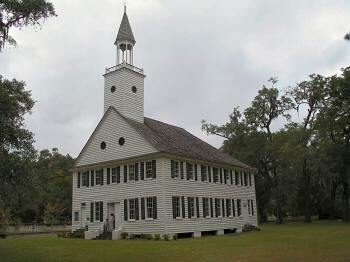 On our way to Jekyll Island, we stopped in Midway, and went into Midway Church, built in 1756, burned during the American Revolution, and rebuilt in 1792. 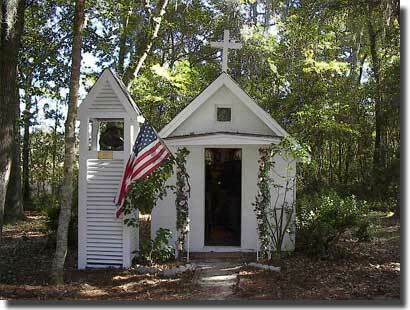 We then stopped at the smallest church in America, in South Newport, GA: It is still an active chapel. It was built in 1950, measures 10 ft x 15 ft, has room for 13 people, a shrimpy pulpit, pews and a stained glass window. Before we got to Jekyll Island, we stopped in St. Simons Island. http://www.stsimonsisland.com/ It is a true beach community. It measures 12 miles long, by 2 1/2 miles wide. Unfortunately, the weather was still pretty bad, so we didn’t go down to the beach. We finally arrived in Jekyll Island, and went to dinner at the Jekyll Island Club Hotel. http://www.jekyllclub.com/ The hotel is BEAUTIFUL! Dinner was pretty good. HAPPY 2nd BIRTHDAY TO MY BEAUTIFUL BOY, PABLO!!! (Saturday) We woke to cloudy skies and drizzle, and MUCH cooler temperatures, which was just fine for our morning tour of downtown Savannah, Georgia’s oldest city. The city is quite beautiful filled with beautiful gardens. The downtown area is made up of many squares ( http://en.wikipedia.org/wiki/Squares_of_Savannah,_Georgia) because of the grid system of the streets. After our guided tour of the city, we walked around River Street, got some ice cream, and then I walked back to the hotel to go for my run. I am supposed to do my long run Sunday, but our day is very busy, and I won’t have time, so I switched my Saturday and Sunday runs. I mapped out a 6 mile run, and headed out, not really knowing where I was going. I wanted to go for my run before it got too hot, and I picked a perfect time to run. It was about 70 degrees, and drizzling. It felt wonderful. I ran downtown, and through Forsyth Park, where 100’s of artists had claimed a section of sidewalk to create art directly on the sidewalk with pastels, chalk, etc. There was live music and a lot of people. And, the park is beautiful, too! I kept running, with slight concern about where I may end up. I was in a strange city, felt (and looked) like a foreigner, and really didn’t want to run through any shady neighborhoods. Everything ended up being okay, and my run was great! One of the best runs I have ever had, actually! I had a lot of energy, and the drizzle felt really good. When I got back to the hotel, I went for a swim and a soak in the hot tub, which felt really, really good. For dinner, we went to Pirate’s House. It was built in 1753, and connected to the restaurant, is the oldest house in Savannah, built in 1734. http://www.thepirateshouse.com/history.html I had salmon, which came with a green salad and biscuits. It was okay. At the end of dinner, I struck up a conversation with a 70 year old woman. The conversation was just what I needed: it was eye opening, validating, and an ego boost. I told her about my life, my goals, my hopes and dreams, and she complimented me and told me she commends me for working with children and being so passionate about it; it is admirable, and rare to find. She said I was… “quite a catch.” 🙂 It was absolutely wonderful speaking with her. After dinner, which was finished quite early, I decided I wanted to go out downtown. It was Saturday night, and I was in Savannah! The city was busy! We went down to River Street, where we sat outside at Rocks on River Street, and had dessert and beer. AMAZING apple pie! It is part of the Bohemian Hotel. http://www.bohemianhotelsavannah.com/dining/dining.asp It was a great place to people watch, and it was right on the river. There was also a fireworks display! They do it every Saturday night. It was incredible! After dessert, we walked along river street, which is filled with bars. It was crazy to see people walk out of the bars with their drinks in hands! There was live music in a lot of the bars, and we stopped at one bar to listen to one of the bands. We then walked a little more, and MORE live music! There was another band playing across the street (closest to the river), and there were beer gardens, and art stands set up, and a LOT of people having a great time. The band was playing Carolina beach music. We hung out there for a while. Savannah reminds me a lot of what I picture New Orleans being like. It definitely feels like I am in the deep south, where Charleston feels more east-coast like. Actually, Charleston feels more European. When we had dinner at Muse, I felt like I was in Europe! Both cities are very different, yet they have tons of history and character. It’s hard to pick which one I like better. I would need to spend more time in each city. (This was my day yesterday). We got up early this morning for our trip south to Savannah. On the way, we stopped in Beaufort, SC. Beaufort (pronounced Byoofort, like beautiful) is a VERY small town (13,000 people). When we got there we kind of wondered why we stopped in this town, but once we went on a carriage ride, and learned the history, we understood the appeal of this small town. First off, many, many films were filmed in Beaufort: Prince of Tides, Forrest Gump, Forces of Nature, Rules of Engagement, Jungle Book, White Squall, Something to Talk About, The Legend of Bagger Vance, GI Jane, and The Last Dance. After our carriage ride, we had lunch on the waterfront at Luther’s. We sat outside, and the breeze was very refreshing. It was warm today. We arrived in Savannah about an hour later, and it was HOT! We checked into our hotel, walked around for a bit, and then got ready for dinner. (No running for me today. It was my day off. I did check out the Bikram Yoga studio, but I missed the last class of the day). We went to dinner at Lady and Sons. It’s Paula Deen’s restaurant, for all you Food Network groupies. http://www.ladyandsons.com/ It was true Southern cooking: collard greens, fried chicken, creamed corn, how cakes (it’s a pancake made with corn meal), biscuits, country fried steak, mashed potatoes, black-eyed peas. Honestly, the food was okay. We did the buffet (which had all the mentioned food), and I liked the mashed potatoes and the how cake the best! The mac and cheese was NO comparison to my homemade mac and cheese. For dessert I had a piece of gooey chocolate chip butter cake, but by the time dessert came, I was so stuffed I could barely taste it. I think it was good? One interesting thing to note about Savannah. There are no open container laws. Everyone was walking the streets carrying their drinks. Tomorrow morning we do a tour of downtown Savannah. Stay tuned for my commentary! I had weird sleep again last night. I fell right to sleep, then woke up 20 minutes later, started thinking about anything and everything, and could not fall back to sleep. It was very frustrating. Maybe my body thought I was only lying down for a nap? (because it’s used to Seattle time still) I was exhausted, yet I could not shut my mind off. I FINALLY fell asleep an hour and a half later, and when it came time to get up this morning to go on the tour of some plantations and gardens, I couldn’t do it. 😦 I needed my sleep. So, I fell right back to sleep and slept until 10:45! Wow. I needed that. I felt SO much better. It was a BEAUTIFUL day. Cloudless skies, and low 70’s already. I got out of bed, and because I had missed breakfast, I went hunting for a Starbucks (I gave up caffeine a while back, but I am back on it…small amounts). I wanted to find this cute Starbucks we had passed a couple of times. It’s in a cute white brick house. I couldn’t find it. I went up and down the streets by our hotel, but I could not find it. After walking for 30 minutes, I gave up. So, I found one on King St, the main street downtown. I grabbed a coffee and a scone, and walked leisurely back to the hotel, planning my day in my head. I headed out for an easy 3 mile run. I felt SO much better than I did yesterday. I actually had spring in my step. 🙂 The run went well, and when I got back to the hotel, I changed into my bikini and headed down to the pool. It was a perfect day to lounge around by the pool. After about an hour by the pool, I started craving a smoothie, so I googled smoothie places in Charleston, and found one about a mile away: Planet Smoothie http://www.planetsmoothie.com/. I got a yummy peach, berry, banana smoothie with protein powder and walked back to the pool. There were a lot of young people by the pool: I met some interesting people from Nashville and some very nice people from Baltimore. They were here for work and for a wedding, respectively. There are a lot of people here for weddings, actually. I lounged around the pool and went swimming. I was out about 4 hours, and I got myself a tan! Yipppeee! No more pasty white Seattle skin. 🙂 (I went and bought some sunscreen before I went down to the pool). For dessert we stopped into a gelato place after dinner. All the flavors were a little too exotic for my taste, so I had a piece of marzipan shaped like a peach. 🙂 For those of you who don’t know what marzipan is: http://en.wikipedia.org/wiki/Marzipan. You either love marzipan, or you hate it. It has a very unique flavor, which I love!